This morning I had a chance to sit in on the junior math triad at our school. The triad is made up of three schools – St. Gregory, St. Daniel and St. Monica. The teachers in each triad meet throughout the year and set their own learning goals as the year progresses. These learning goals become the basis of our school improvement plan. I believe that this is a very powerful model for professional development. It puts the teacher in the driving seat and shows due respect to the adult learner. I try to sit in on as many triad meetings as possible and I always find their conversations really interesting. 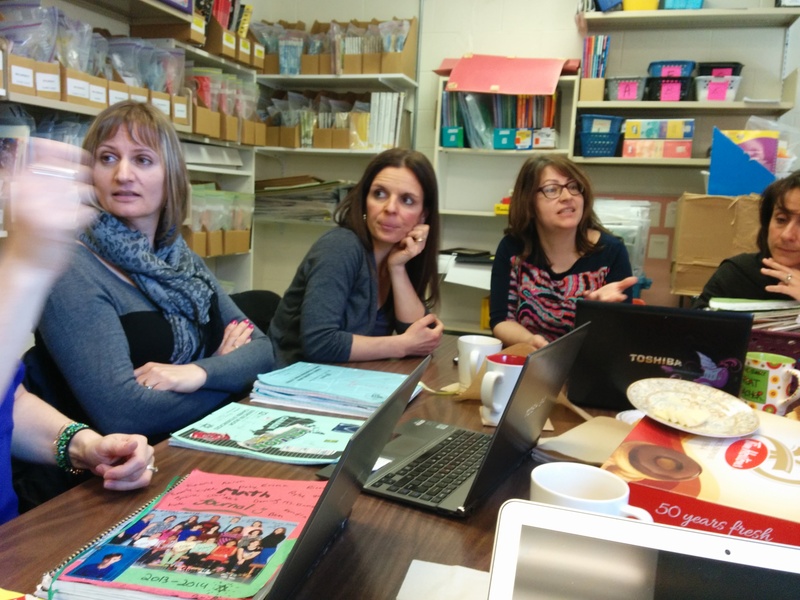 Because the teachers set their own learning goals and decide when they are going to meet to work on their own inquiries there is continuous discovery based on the evidence gathered from student work. I have been fortunate enough to work with this group throughout the school year. They have been working on a continuing inquiry on the use of math journals as a way to introduce and reinforce math concepts. 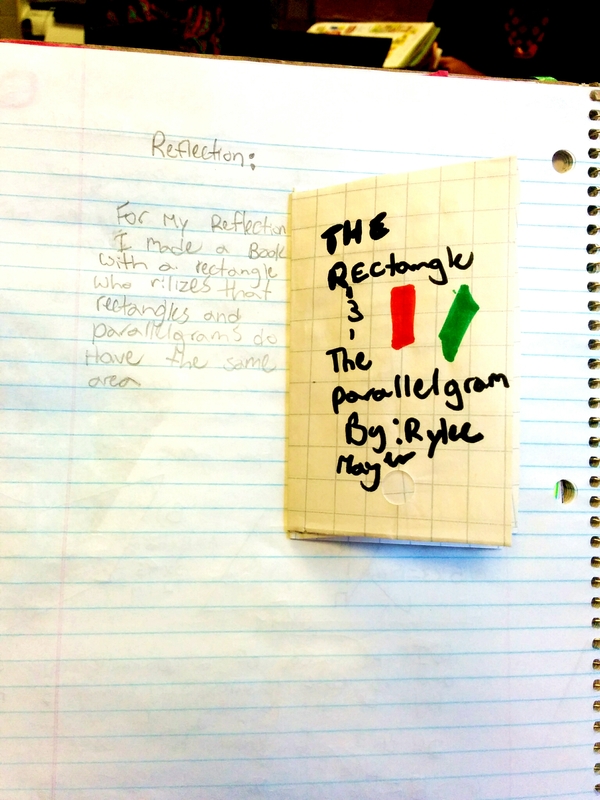 The rectangle and the parallelogram – a student reflection on learning. If we continue to solidify students’ ability to communicate about math through the use of math journals with support through conferencing, then they should be able to demonstrate their learning through oral or written responses using math language..
At this point, the teachers are reflecting on what they have learned this year and where they want to go in the future. Reading through the math journals, it is very interesting to see how the students reflect on what they are learning. The teachers shared some of these reflections with me and I am posting them here. The junior triad is now exploring how the journalling, especially the reflections can lead to more sophisticated student inquiry. They have learned that the ground for inquiry needs to be carefully prepared before jumping into one. 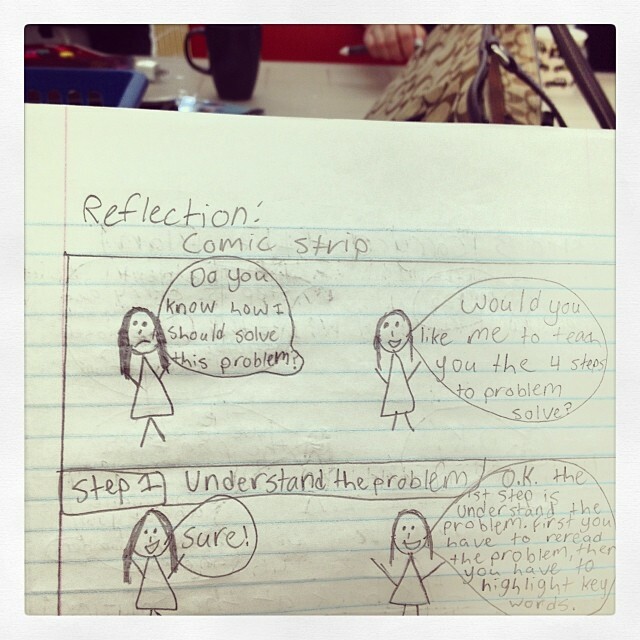 The math journals, leading to individual student reflection on learning is a great way to do this. The wonderful thing about the triad teacher inquiry process is that teachers choose what they want to learn based on the needs of their students. They all record their learning in an Evidence of Learning document that gets updated every time they meet. Ultimately, their inquiries become the basis for our school improvement plan. Where to next? Now what? “The journals have shown us that explicit teaching prior to, or in combination with, inquiry allows for more success. We need to fill the student’s toolboxes with concepts and strategies before we can expect them to be confident in problem based inquiry. Confidence is one of the most important tools for students to be successful! We have also learned that the journals have built in differentiation for all the learning styles in the classroom with the flexibility and creativity allowed in the reflection piece. We will definitely continue the Math journal into next year. Where possible, the students remaining in the school will have their journals passed on to the coming teacher and continued on from there (teacher discretion). We hope to take the explicit teaching in the journals and use it to strengthen the students’ inquiry skills. Possibility for next year are some shortcuts for the kids who have a difficult time with copying or concepts, for example having the curriculum learning goals pre-typed, having some of the interactive tools photocopied, creating alternative interactive tools based on student needs. Really interesting to see concrete examples of teacher learning taking off once they are given the autonomy to try out new concepts on their own! I’m wondering… which is richer.. the math dialogue in the classroom or the writing of the students? Are they equally able to reveal student thinking? I’m wondering…. is it an assumption that students need to have math concepts ‘front-loaded’ before problem solving? Can student learn mathematical concepts through inquiry in order to construct meaning? If students are taught the concepts, does problem solving become mere application or is there ‘real’ thinking happening? What would your observations tell us? Just wondering – something to think about for next year. I don’t think it is an assumption that math concepts need to be taught up front – it seems to be the experience of the teachers. Based on what I have heard and experienced, I think there are front-end skills that need to be explicitly taught to allow for more meaningful inquiry.